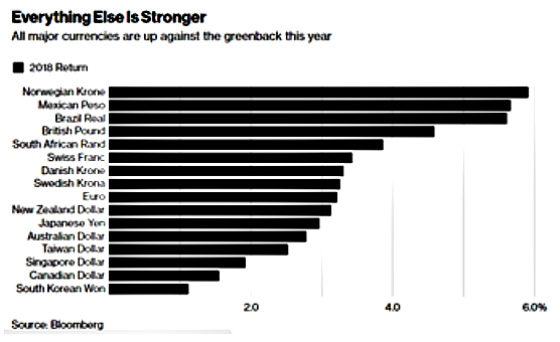 Is a weaker dollar good for the U.S.? Trumpling On The Dollar!Is a weaker dollar good for the U.S.? Trumpling On The Dollar! “Obviously a weaker dollar is good for us as it relates to trade and opportunities,” Mnuchin said, according to Bloomberg, adding that the Trump administration is not concerned about the dollar’s short-term value. 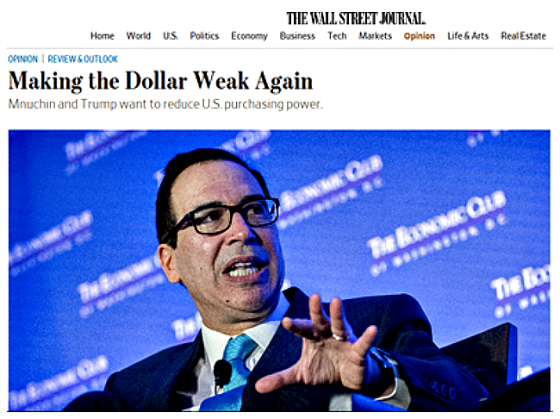 The Wall Street Journal, a strong believer in a strong dollar, was unsurprisingly quite miffed at Mnuchin’s statement and the unintended consequences of it as the following editorial headline implies (more on this later). When the United States runs a trade deficit it usually means that our economy is growing nicely and since the dollar is the world’s reserve currency, our deficit helps lubricate world trade and economic output. Most people don’t realize that trade deficits are a sign of prosperity and when the gap is narrowed that usually means economic growth is weak or contracting. The following graph shows how the trade deficit grows while the economy is growing and then it shrinks during recessions (shaded areas). The shaded recession areas clearly show that the trade deficit shrunk in each of the last two recessions, particularly during the Great Recession. One can also see that the current recovery has been pretty steady and muted if the trade deficit is an indication. It’s clear that the Trump administration wants a lower dollar as the president naively believes that a trade deficit means that America is losing in trade and the best way to fight back is to depreciate the currency. Since shifting to floating currencies from fixed exchange rates the dollar has tended to move in fairly long waves but usually has hovered around a value of 90 to 100 as measured by a trade-weighted index against major currencies. The following chart shows its ups and downs since 1973. One can see that it’s generally struggled to get above 100 over the last 30 years and when it does it turns back down relatively soon after. There have been two clear up and down cycles. It’s probably fair to classify the most recent cycle as an up one as well since it lasted nearly five years and saw the dollar appreciate by approximately 30%, although it is the weakest of the up cycles. 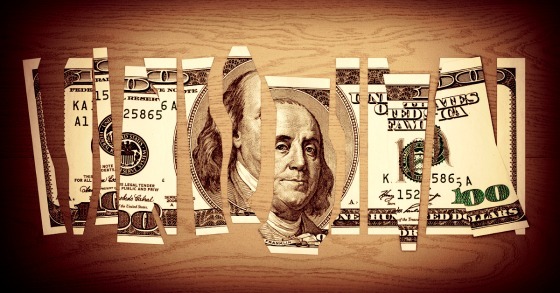 The first upcycle lasted 6.5 years and saw the dollar appreciate by 63% and the next one lasted nearly seven years and the dollar strengthened by 43%. The first bear market lasted a little more than 10 years and saw the dollar drop by 46% while the second was a little more than nine years with a 39% depreciation. What is interesting, or perhaps disconcerting, is that Trump is seeking a weaker dollar from a starting value that is not very elevated. In the previous two peaks, the values were 146.9 and 113.1 whereas in this latest potential peak it was 96.9 on December 28th, 2016 which was after Trump was elected but before he took office. The previous two bottoms were 89.9 and 79.2. If history is any guide then the downside should be somewhat limited unless the U.S. economy dramatically underperforms other major countries or we make it very inhospitable for people to invest or come visit. 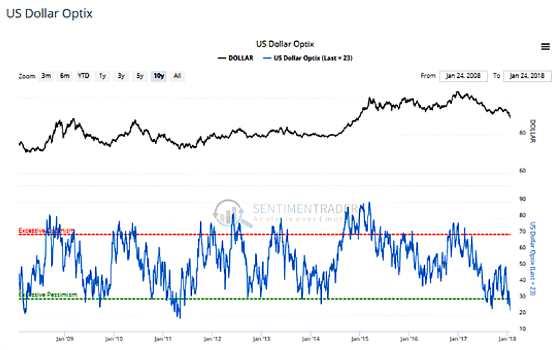 One can see from the following chart that investor sentiment is overwhelmingly negative towards the dollar which is actually a bullish indicator. When everyone is leaning in the same direction, it doesn’t take much to tip over the boat and reverse the downward price trend. There are some very compelling charts in the article suggesting that the dollar could be in a long-term bear market, although it is oversold enough to be set up for a shorter term rally. 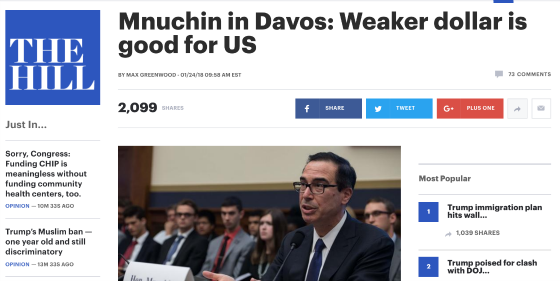 And despite Trump now saying the markets misinterpreted Mnuchin’s comments and the dollar will get stronger I’m skeptical unless he now uses the strength of the dollar as the ultimate measurement of his success in the international business arena versus the trade deficit. So far the markets have spoken as the dollar has fallen against every major currency since Trump’s election despite stronger economic growth, a booming stock market, and higher interest rates. The weak dollar has led to a big rally in many commodities as it is perceived to be inflationary and since commodities are priced in dollars, a weaker dollar makes it cheaper for the rest of the world to buy commodities, thereby potentially pushing up demand for them. The rise in commodity prices can also serve to offset exchange rate moves, thereby keeping the price of commodities at a similar level in terms of foreign currency. Gold is often one of the prime beneficiaries of a weaker dollar. 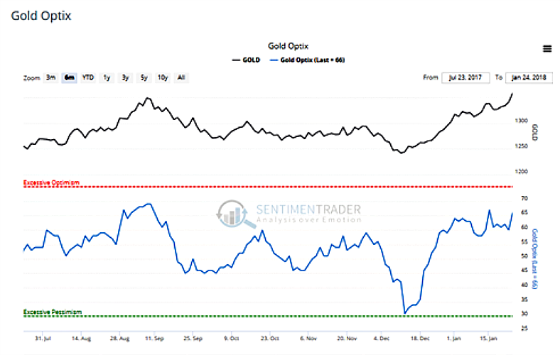 The following chart shows how gold prices have shot up over the last month while sentiment has, not surprisingly, gotten much more bullish as narrative and sentiment almost always follows price. People tend to construct reasons as to why prices moved after the fact in order to support and justify the trend and to make them feel better about being invested with it. And as the trend tends to support their rationale then investors become more confident about the prospects for the asset continuing to move in the same direction and this growing uniformity of opinion tends to feed on itself and reinforces the trend until something changes to allow cracks to form. Eventually, the trend begins to reverse with very little notice and after most of the public has been sucked in towards the top. I digress. While most people understandably think oil moves based on supply and demand, the dollar can also have a big impact as well. 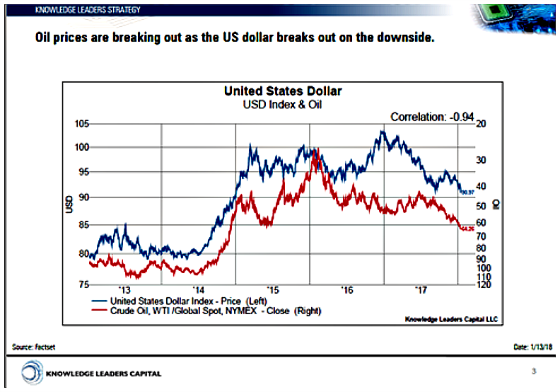 One can see how negatively correlated oil and the dollar have been over the last four years. 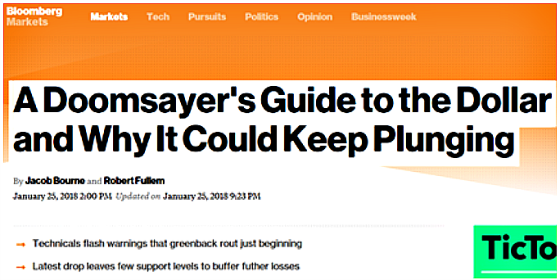 In other words, when the dollar rises, oil drops and vice versa. Oil also bottomed earlier than gold and its level of bullishness is extremely high. This next chart shows a longer-term perspective. The price rise looks more muted because it hasn’t moved much on an absolute basis, although it has on a percentage basis since it is coming from a lower base. It does also put the bullishness in perspective as it is at extremely high levels. 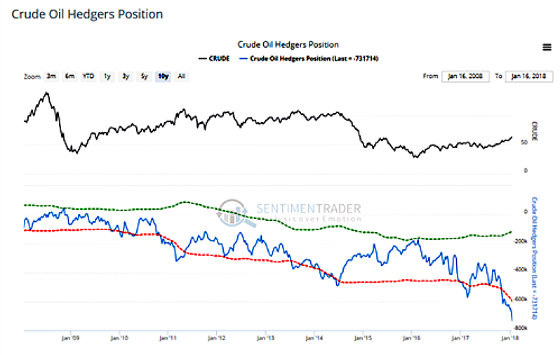 The oil companies that use futures contracts to hedge are extremely willing to provide oil to the market at current prices by having a record net short position. 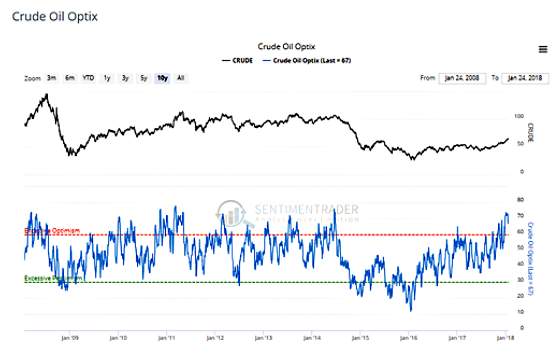 This ultimately tends to result in oil prices correcting. It seems pretty clear that the Trump administration wants to “win” at trade and they measure winning by a reduction in the trade deficit and the easiest way to facilitate this is to engineer the dollar lower. Given this, it would seem that a rally in the dollar may only be in the context of a longer-term bear market as we have seen these cycles can last for a long period of time. 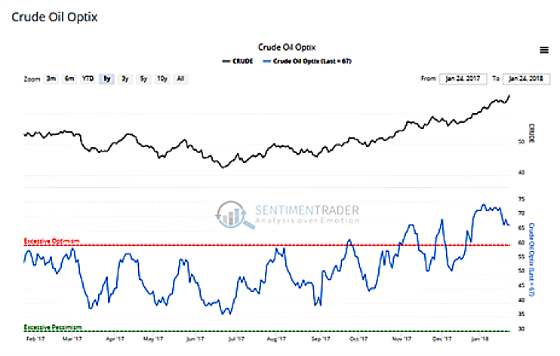 Along the same lines, perhaps any correction in oil prices may be short-lived and not very deep as dollar weakening may be a strong tailwind for oil prices. This seems to be the thesis of the very bright people at Knowledge Leaders Capital who generated the oil/dollar correlation chart from above. They believe that the dollar has broken down and oil has broken out and this will benefit energy-oriented countries and create more headwinds for the United States to some degree. A weak dollar makes the U.S. worse off because Americans don’t live in an economic bubble. They buy from abroad because other countries make things Americans want or need. U.S. manufacturers import components to produce value-added goods like machinery and aircraft that are exported. Dollar devaluation makes those imports more expensive, which undermines competitiveness vis-a-vis foreign rivals. Commodities like oil and copper are traded in dollars so a weak dollar requires more of them. This is good for dictators in places like Venezuela. For Americans, not so much. Devaluation can make the trade deficit look better for a time and there is often a short-term gain for corporate income statements. But it’s ultimately a fool’s game because the underlying terms of trade don’t change. Companies and prices adjust and, in David Ricardo’s classic formulation, one bottle of wine still equals 10 loaves of bread. Mr. Mnuchin’s comments are all the more baffling because he and the Administration should be riding high. The U.S. is growing faster than it has in 12 years as deregulation and tax reform boost business and consumer confidence. 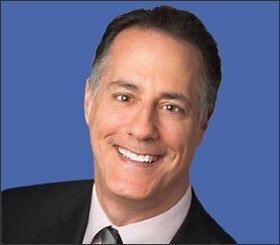 Capital that was sidelined during the Obama years is being put to work. Unemployment is at historic lows. Why mess it up by imitating the economic policy of Argentina?